If you love this song as I do, it’s likely because you know the beautiful version sung by Simon and Garfunkel. And if you love it as I do, you might also use it as a guide to seasoning chicken (more on that later). Knowing it was much older than a 60s hit, I decided to comb the web a bit to learn about the history of the song. There’s a pretty interesting Wikipedia article on this old ballad that gives a bit of background; the playfulness of the lyrics is what interests me most. Part of the song is from the point of view of a young man who instructs his love to do impossible tasks for him, and then it switches to her point of view. She gives him equally impossible tasks—and their relationship depends on the completion of these tasks. It’s sweet and a little goofy, despite the utterly mournful vibe of the S&G hit. But when you really pay attention to the words of “Scarborough Fair,” it doesn’t make sense, at least to me, why the four herbs (parsley, sage, rosemary, and thyme) are mentioned in every single verse. They don’t have anything to do with the rest of the song! For me, this lovely herbal repetition has dictated the way I season chicken dishes for as long as I’ve been cooking (so it’s no surprise that parsley, sage, rosemary, and thyme feature in my whole roast chicken as well). But since I’m sure the point wasn’t to help people flavor meat, I did some Googling to see if there was an explanation. I found a few theories, my favorite of which says that these four herbs, when used together, ward off the evil eye. So look away, all you devils out there—this chicken is protected by musical magic! Taste the magic, people. I have one serving suggestion that I will repeat at the end of the recipe, because it really is a good idea: make sure to have a crusty baguette on hand, because you’re going to want to sop up those heavenly juices. Put your chicken in a pan, legs- and breasts-side down, and drizzle with olive oil. Combine the parsley, sage, rosemary, thyme, garlic powder, cayenne pepper, salt, and pepper, and sprinkle half over the chicken. Then flip the chicken so that the legs and breasts are facing up, and repeat the olive-oil-drizzling and the spice-sprinkling. You could massage the spices into the chicken a bit if you like; I didn’t feel like it today. It’s the cook’s prerogative. 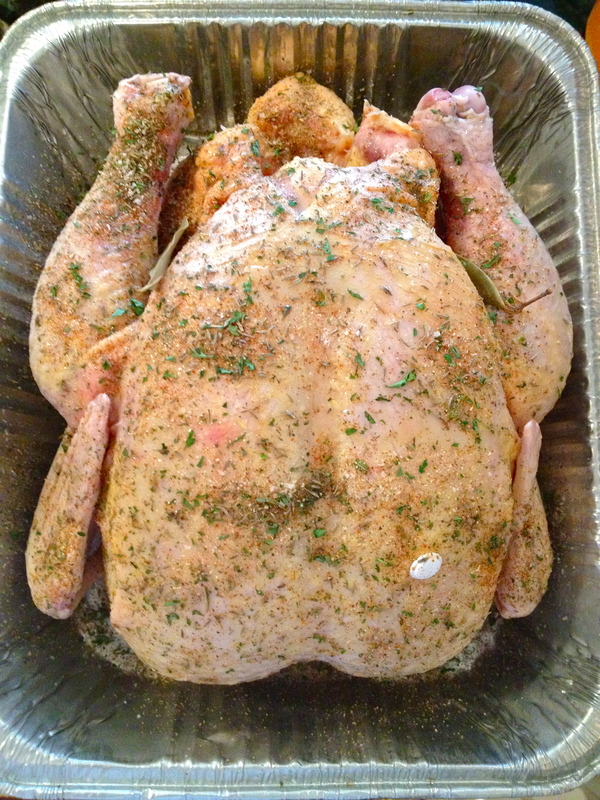 Pop it in the oven for about an hour and 15 minutes, depending on the size of your bird. It’s done when the juices run clear and the meat has lost its inner pinkness. That’s all! 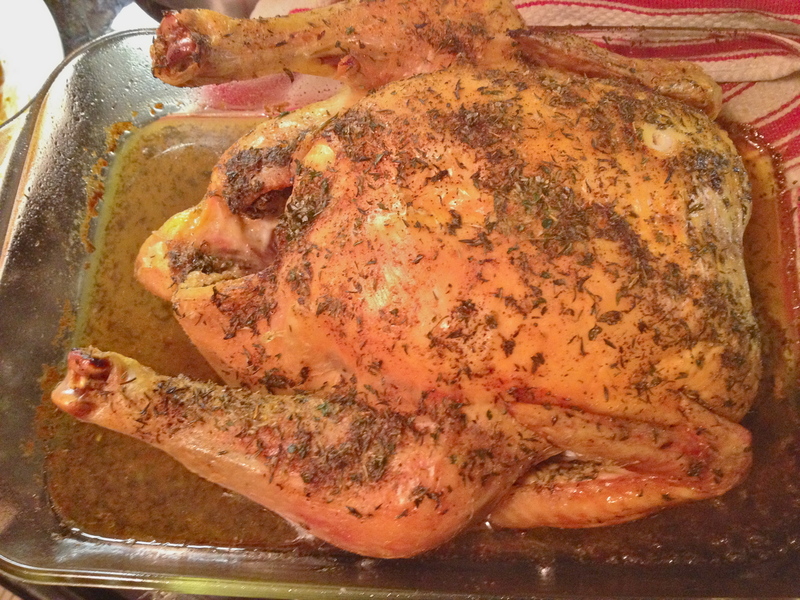 Roast chicken is incredibly easy. Definitely not the kind of task that the young man in “Scarborough Fair” would have requested of his lover. And when you eat this, you’ll enjoy it so much more if you have a nice crusty loaf of bread to dip into the juices—sometimes I think they’re the star of the show, they’re just that good. Previous Celery Root and Sweet Potato Soup. Next Chocolate Peanut Butter Cheesecake. I love that you actually chased down the history of the song for a post on roast chicken. Also, I’m making chicken this weekend for a Passover seder, and I was wondering how I should season it–now I know! haha I betray my true nerd nature. I’m so happy you want to try this seasoning blend! It’s my absolute favorite for chicken. So good, love to hear how you like it! Delightful! 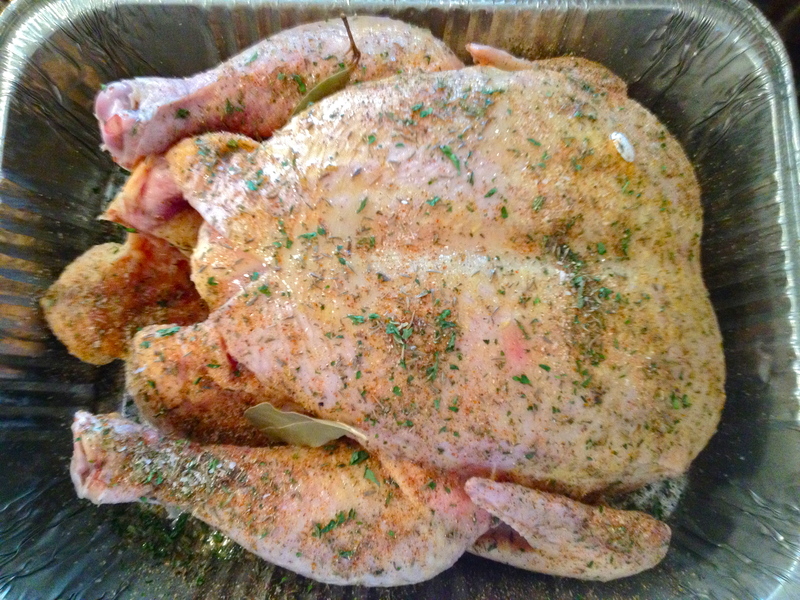 I just roasted a chicken yesterday with a similar spice blend, but I put it in for 45 mins at 350, then finished the last 15 minutes at 400, and I think that made it extra-crispy! oh god yum. I will try that next time! Would love any cool Texas recipe/food prep ideas you’re getting down there!! Kelly, You are so ceative! !� You make everything so appealing.� And you are good at writing…ever thought of being a food editor at the Trib? Talent glore!!! The host of your baby shower so many years ago!! Aww thank you! :) It’s a lot of fun to cook and write in my spare time, but I think I wouldn’t enjoy it as much if I had to do it for my job. But you never know though! 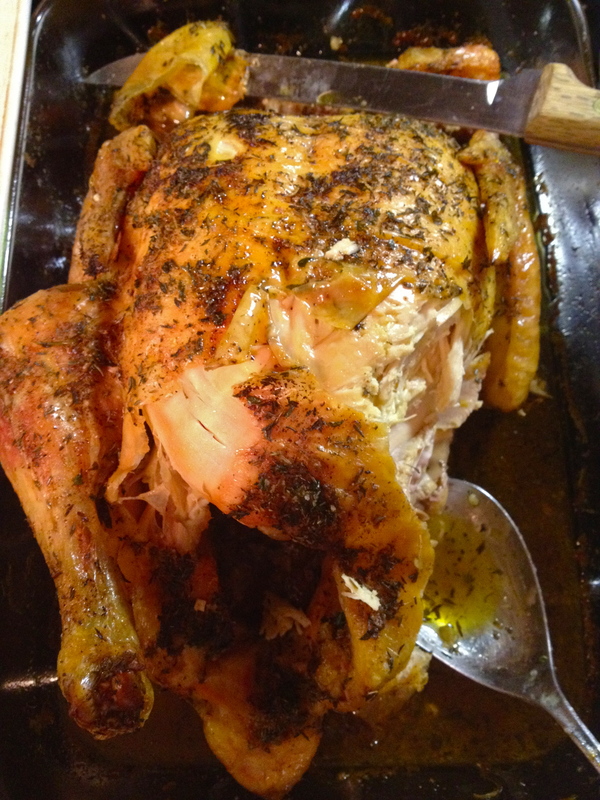 Maybe some day…..
Hey Kelly, made the chicken last night…soooo good and easy!